The percentage of a team’s points, sorted by location. Sometimes I get bored and look for unusual topics to post about, which eventually leads to spending too much time on something like making graphs revolving around scoring and defense. The graphs I made are pretty basic, I suppose. I might have fun with more over the weekend but I’ll just show what I fooled around with already. Basically, there are four different graphs for every team: team point distribution across six locations, team effective field goal percentage in five of those spots, and the same two for a team’s defense. All of the stats I used were from NBA.com. 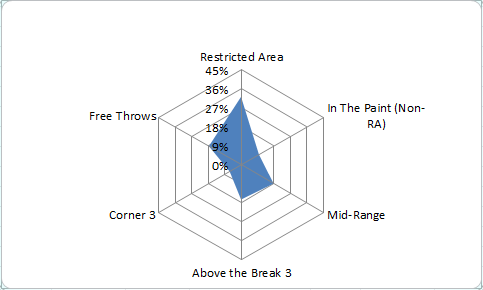 The point distribution graphs show what percentage of a team’s points come from the restricted area, paint not in the restricted area, mid-range, the corner three, above the break three, and free throws. I experimented with field goal attempts per spot, but the graphs compared to point distribution looked about the same. I can certainly post individual team graphs at another time, but I chose not to here for the sake of the amount of space it would take up. That doesn’t mean we can’t compare some, though. Portland and Houston are quite a contrast in styles, given one’s love for the mid-range jumper (and for a very legitimate reason) while the other neglects that part of the floor. Philadelphia is somewhat similar to Houston except they rarely score from the corner three and their mid-range game is more prevalent. Also, they might have the right idea on offense but as we’ve seen recently they don’t score all that well and they struggle to defend. More on that in a bit. For now: POOR THADDEUS YOUNG. Among other similarities are Atlanta, Brooklyn, Golden State, the Lakers, and Toronto all looking alike too. Starting from the restricted area and going clockwise, the leader in points distributed to each category are: the Detroit Pistons (41.72%), Memphis (14.21%), Boston (22.62%), New York (21.41%), Miami (10.68%), and Houston (20.47%). Among other teams, Indiana’s offense and defense are quite similar, for better or for worse. The leaders in each category, starting at the restricted area and going clockwise are the Lakers (36.65%), Golden State (12.14%), Indiana (23.19%), Oklahoma City (18.98%), Miami (8.39%), and Phoenix (19.95%). Effective field goal percentage from those areas of the floor — minus the free throw line — were another batch of charts I made for each team for the heck of it. You can really see where some offenses are great and others struggle from, though it won’t paint the clearest picture. The same goes for defense. Miami’s efficiency is pretty freaky, especially when compared to Philadelphia’s. It helps when LeBron James, Dwyane Wade, and Chris Bosh can score at the rim far above the average accuracy all while having shooters playing alongside them. For Philadelphia, it doesn’t help when they’re a strong candidate to “Bobcat” and very few of their players can stretch the floor consistently, and Michael Carter-Williams isn’t one of them. Like mentioned earlier, the 76ers have a good idea on where to score on offense while playing at a frantic pace, but they don’t score anywhere near enough and their defense has fallen off a cliff. Possibly noticeable in the GIF of offensive EFG% is Chicago, who also struggles mightily on offense but their defense holds its own. Miami’s another interesting case. They can light teams up from the corners but that’s also a place opponents have shot well from. I also made GIFs of teams sorted by their offensive and defensive ratings, but overall there wasn’t a clear difference in those highly efficient in one area of the floor and those who struggle. Portland, for example, scores a bunch from mid-range with the help of LaMarcus Aldridge, but they’re also a top-5 team in offensive efficiency. On defense, the percentage they allow at the rim is quite good but they allow a ton of attempts from that area of the floor. Defense is weird. In the future, I might fool around a little further with these kind of graphs for both teams and players. The ones listed here are pretty basic and obviously won’t paint a clear picture on offense and especially defense, but hopefully they were fun to look at and compare team by team. As (sort of) mentioned earlier, a page with every team’s graphs wouldn’t take long at all, though I chose not to include them here because of the amount of space it would take up when combined with GIFs. Any thoughts, even if the graphs weren’t all that cool to look at, or requests on these are certainly welcome. Feel free to chime in.